The mission of the Partner Church Committee is to sponsor and coordinate an on-going relationship with our Unitarian Partner Church in Nyaradszereda, Transylvania, Romania. Unitarianism has its roots in Transylvania where it was founded in the 1500s. After the fall of Communism, relationships between American and Transylvanian parishes were established. This work is an important part of our international outreach at First Parish Church. The congregation in Nyaradszereda gathered in the late 1980s and worshiped in a very small addition to the back of the Roman Catholic church in town. After the end of Communism, the government gave the congregation a plot of land in the town center in repayment for assets confiscated during Ceausecscu’s rule. It took ten years to build their church. Members of their parish contributed both money and hard work. Their minister, the Reverend Szilard Sandor, worked tirelessly to help his congregation find funds from many sources. First Parish Church, Duxbury provided financial assistance and spiritual encouragement, as did churches in The Netherlands and Norway. Slowly, the church was completed. 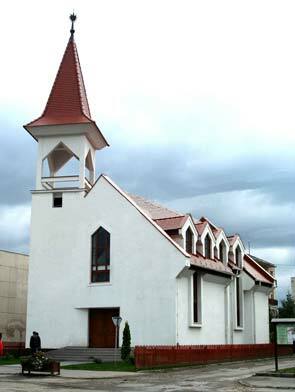 In October, 2012, the new church in Nyaradszerada was dedicated. 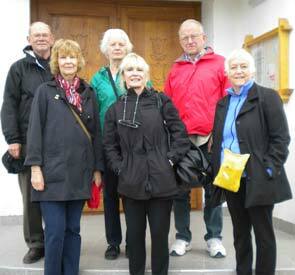 Members of our congregation were invited to attend. Representing First Parish Church at the ceremony were the Reverend Catherine Cullen, Sunsue Fleming (our former Director of Religious Education), and four parishioners: Marilyn and Bill Christmann and Jon and Meredith Lehman. We were deeply moved and honored to be part of this joyful occasion.